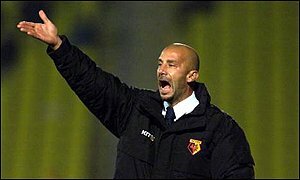 Gianluca Vialli has issued court proceedings after his sacking by Watford last June. The Hornets tore up Vialli's three-year contract with two years left to run after a disappointing season in which wage costs at Vicarage Road soared and the team finished a lowly 14th in Division One. Vialli has been negotiating a settlement for months, but the former Chelsea manager's decision to go to court could not come at a worse time for the club. Watford narrowly avoided slipping into administration this season by forcing their players and staff to accept a 12% wage deferral and raising funds via a share issue. But manager Ray Lewington held a sunshine summit with his coaching staff in Portugal this week to decide how to further reduce the size of the Watford squad for next season. Lewington is resigned to working with less players and will not have the money to keep several who are out of contract this summer unless Watford win promotion to the Premiership. But he discussed where the axe could fall with assistant Terry Burton on a four-day training camp ahead of a crunch meeting with the Watford board in a month's time when he will learn his long-term budget. Lewington said: "We know what we'd like to do but the crunch will come when the board tell us what we can do. There will be wastage. "There will be players coming to the end of their contract that we won't sign even if the money is right. We have to prioritise our needs and we've used the Portugal trip to do that. "But a lot will depend on the money we are given. I can talk until I'm blue in the face but if the club can't afford to do what I want to do it's pointless." Links to more Watford stories are at the foot of the page.